1. Add all ingredients to a highball glass with a few ice cubes. 2. Garnish with celery, shrimp on a skewer, and a slice of lemon. Are you a fan of Old Bay seasoning, seafood, and spicy things? 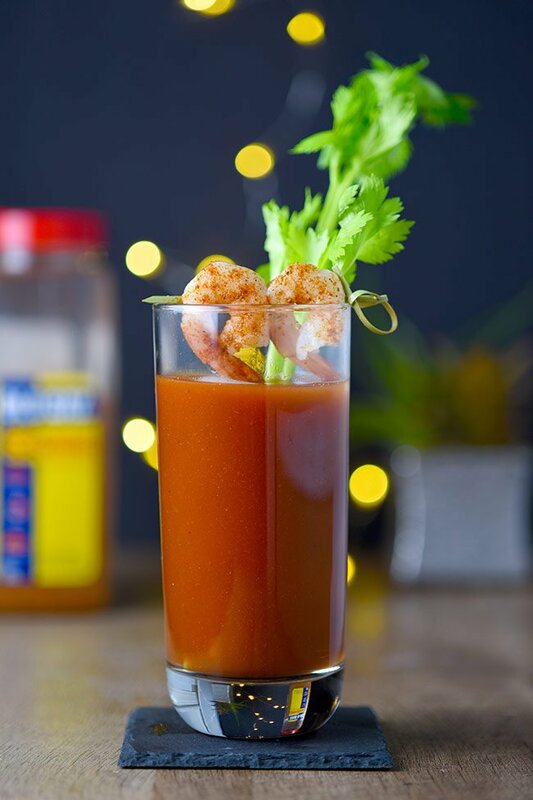 Then you’re going to love this Maryland-inspired Bloody Mary recipe! I’ve always wanted to be a Bloody Mary fan but it wasn’t until I went to a Bloody Mary bar, fully stocked with everything you can imagine possibly putting in a Bloody Mary, that I finally figured out what was missing for me — you guessed it. Old Bay. Other than a few oddball ingredients, the only thing you might need to run to the store and get, is some cocktail skewers. By the way, this recipe can be multiplied and stored in pitchers very easily if you’re hosting a brunch. Just keep the pitchers chilled and pour over ice when you’re ready to serve. If you want to get fancy, rub the rims of your glasses with lemon and dip into Old Bay. P.S. If you love Old Bay, check out my family’s favorite hot Maryland crab dip recipe.